Last summer, Movieweb was invited by Sony Pictures to the set of Goosebumps in Atlanta, Georgia. Goosebumps, for anyone living under a rock for the last thirty years, is a collection of children's horror books by author R.L. Stine. Stine is one of the best-selling writers in history with over four hundred million books sold. Goosebumps has had several adaptations over the years, but this is the first big-budget, Hollywood movie. Goosebumps is produced by Scholastic Media's Executive Vice-President, Deborah Forte; an industry stalwart who was also responsible for the popular 90s TV show based on the books. Jack Black stars with direction by animation and effects veteran Rob Letterman. Our first note from Sony was to wear proper shoes. This is what you want to hear as a reporter attending a movie set. Why? Because the odds of just sitting around in a studio for hours watching takes is substantially decreased. Interest is piqued as our cohort may actually do something worthy of protective footwear. We arrive at the production offices about 40 minutes north of Atlanta. During the drive, we are briefed by the unit publicist on story details for the first time. The Goosebumps movie takes place in Delaware, but was shot in the small Georgia town of Madison. Jack Black stars as the author R.L. Stine, who lives as a recluse with his daughter, Hannah (Odeya Rush). Stine's new teenage neighbor, Zach (Dylan Minnette) strikes up a friendship with Hannah. Despite dire warnings from her father, the pair accidentally unlock Stine's original manuscripts of his Goosebumps stories. It turns out that Stine's monsters are very real. They escape off the pages of his books and unleash havoc on the unsuspecting town. Stine must join forces with the children to capture the monsters and put them back in books. We're lead to a conference room where production art, storyboards, and monster photos have been set-up for our review. It's the fifty-fifth day of filming with the shoot coming to a close in a couple of weeks. The artwork is impressive. Fans of the books will get a kick out seeing their favorite monsters come to life. The film has a lot of visual effects, but there's also quite a bit of prosthetic and make-up work. We're told that every monster from the books will have an appearance in the film. Our first interview is a real treat. We're introduced to Stine's nemesis in the film, the dastardly puppet Slappy. Slappy is probably the most famous of Stine's characters. We're told that Slappy will be a memorable villain. His puppeteer is Avery Jones, a local performance artist and actor. Jones had us in stitches operating Slappy. Jones does the voice over on set, but will most likely be replaced in post-production by Jack Black. Jones was a marvel, an extremely talented guy. Our next interview was the man himself, Jack Black. I've put the entire interview at the bottom of this article. So jump to that if Jack Black is your only interest. The most striking thing about him was how thin he looked. He's lost a tremendous amount of weight and looks markedly different from his days in School of Rock. Not to worry folks, thinner doesn't mean less funny or engaging. Jack Black was on fire with his antics during our time with him. After talking to Jack Black, we are giving a full tour of the production facility. The first set we see is a giant green screen wrapped around a raised stage. Throughout the day, various actors in costume and make-up were filmed here for the effects team. They were scanning them in using specialized equipment. These processes are arduous and time consuming. Audiences really need a chance to see the unsung effects wizards who put in thousands of hours to make minutes of screen time look realistic. We're sat behind a very elaborate set of R.L. Stine's house. Picture a creepy old Victorian house with large windows. This was the beginning of several scenes we would observe with Jack Black and his three young co-stars: Dylan Minnette, Odeya Rush, and Ryan Lee. Lee plays Champ, Zach's best friend. He's dressed in a suit and is filming a scene where he's being attacked by the abominable snowman. The snowman is CGI and will be inserted in post. A production assistant walks beside the cameraman holding up a visual marker for Lee. He screams bloody murder as the camera zooms in on his terrified face. The set-up changes for the takes. As Lee shrieks while ostensibly under abominable snowman attack, Dylan Minnette (Zach) rushes him and knocks him down. We infer he's pushing him out of the way from becoming a snowman snack. The scene continues with Dylan Minnette hiding behind a large chair, communicating silently to Odeya Rush. She's off screen and he's mouthing instructions to her. We get our first glimpses of Director Rob Letterman giving his cast stage directions. Letterman and Jack Black have worked together twice before, on the animated Shark Tale and live action Gulliver's Travels. Letterman seemed to be open to comments from his young actors. Some directors are very authoritarian on set, which can lead to tension as production goes on for hours. Letterman had a calm demeanor, which was also shared by his crew. Filming went on for a couple of hours before the teens took a break to talk to the journalists. Minnette, Rush, and Lee spoke at length about their favorite scenes. They loved working with Jack Black and were all huge fans of his. During our talk, they disclosed a MASSIVE story twist that will certainly catch audiences by surprise. I won't even hint at what they said, but trust me, it's a WHOPPER in the plot. Our lovely publicist interjected to remind us that the story details were strictly under quarantine until the film's release. The revelation made me that much more excited to see Goosebumps. At least we know that the plot isn't vanilla, and that there are many surprises in store for fans. Our next segment was by far the highlight of this set visit. We were led out of the studio warehouses and into the woods, drumroll please, where an entire amusement park was built for the film's finale. Wow, just wow. This place was a sight to behold. And the reason why we had to wear proper shoes. The massive set was built in the mud. Crews were using particle board to move gear. But otherwise it was deep, gooey, red Georgia mud an inch thick. We all felt like kids again exploring this incredible set. Imagine a broken down amusement park, overrun with vegetation. The amusement park is where Slappy and the monsters have their final showdown with Stine and the teens. I can't wait to see the finished scene as the park looks absolutely great. We were allowed to stay in the park for about an hour before being taken back inside. The next scene we observed was with Jack Black and the teens confronting Slappy for the first time. As Black walks through the house with the teens in tow, they come upon Slappy waiting for them in a chair. Avery Jones, Slappy's puppeteer, voices the lines in a high-pitched, raspy tone. Slappy is such a sinister looking puppet. Obviously he can't be cute or cuddly, but that thing would scare the hell out of me if I was a kid. Letterman does multiple takes from various angles of this scene. The set-up time between the scenes is long. Filming a scene with visual effects to be added is extremely complex. You have to give actors credit for keeping energy up and staying in character. This entire scene is probably a minute in the film, but takes hours to shoot. It was at this point that we got a few minutes with Director Rob Letterman. His primary goal was to balance the humor with the horror. 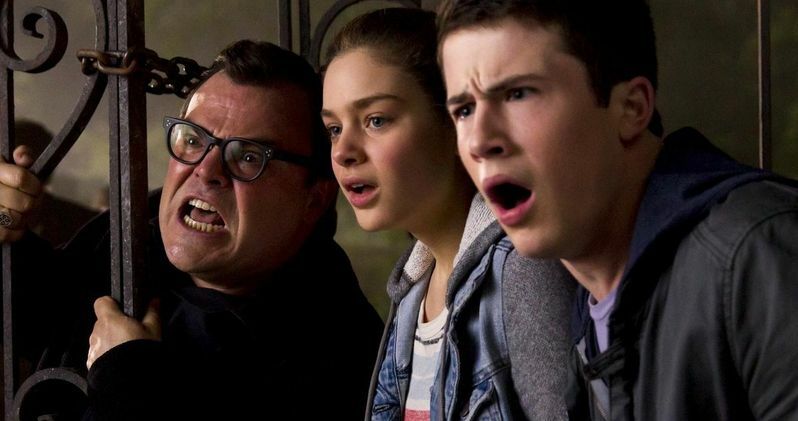 Goosebumps will have its scares, but is a family film meant for children of all ages. Letterman had fond memories of the books and had nothing but praise for his leading man. Our day ended with another look at the production room. Goosebumps has several big action pieces that take place throughout the town. At the very least, the action, monsters, and visual effects are going to be first rate. Jack Black has always had excellent chemistry with younger actors. We only saw a few scenes filmed, but I'm pretty confident the ensemble will play well. Please see below our full interview with Jack Black, where he goes into depth about the monsters, the scares and more! This is your third collaboration with Director Rob Letterman. What was it like working with him again? Jack Black: It was great. I had so much fun working with him on Gulliver's, so we have a short hand. We know each other's sense of humor, and it's been really cool getting back together after these years, both of us have learned a lot since then. I was looking for another opportunity to work with Rob, I really like him. We know the overall premise about the monsters and mayhem, but could you just talk to us about your character specifically? R.L. Stine is like the keeper of this huge responsibility. How does it affect the relationship with his daughter? Jack Black: He allowed me to move in with him. I was able to shadow him for a few months. It's what I do for all my characters, I like to soak in the personality. I wear his underpants, I'm actually wearing his underpants right now. I live and breathe R.L. Stine. Like when Johnny Depp moved in with Hunter S. Thompson. Jack Black: Exactly, exactly like that. No. I spent a couple of hours with him before we started shooting. We went out to New York, had a little lunch, just a little chitchat about scary things, and our plan for the movie. He was into it, he was stoked. I mean, it was important to us that we had his seal of approval. Just to see if he had notes on what we could do differently or if he liked the direction that we were going. Also, we didn't want a situation where we made this movie based on R.L. Stine's books and he would be like, "I never agreed to this! This is bull!" Were you a fan of the books before the film? Jack Black: I didn't read them before, I was a little before their time. When I was a kid in the seventies they didn't have Goosebumps. They didn't have computers, they didn't have cellphones. When I was a child, I walked thirty miles through the snow to get to school! But I did read some of his funny stories and stuff. There was a magazine he was a writer on back in the day called Bananas and also Dynamite. I would pick up those magazines at the Scholastic book fair. So it's kind of funny that I got to work with him all these years later. I was into scary things, horror films. I was more of a sci-fi dude. The first book I read when I was a kid was A Wrinkle in Time, a great early childhood mindbender. Did you read it? Jack Black: It's great. Right? They didn't make a movie of that one for some reason. Jack Black: They did? A Wrinkle in Time the movie? It must not have been very good though, because I never heard of it. What was I talking about? Oh yeah, did I read his books when I was a kid. No. But I did read some of his books when I got the part in this movie just a research for the flavor. Have you been reading them to your kids? Jack Black: No, we haven't been reading the scary books yet. What have we been reading to the kids? They're really into Captain Underpants, but we'll get there. Tommy's into it, my six-year-old is really into scary movies and stuff so I know that he's going to like those books. Not really scary movies, but scary movies from the forties. They hadn't really figured out how to make things actually scary back then. I don't know if you've seen Invisible Man from like 1932 or whatever, not scary at all, just funny and not on purpose. Jack Black: No Saw! Oh my God! But somehow Sammy, my eight-year-old, was like aware of the Saw guy, just his face from like internet memes and stuff. He thought it was like a cool, funny thing, he had no idea the horror behind that creature's face. What can you tell us about the film that we haven't seen today? Jack Black: The premise is that all of R.L. Stine's characters that he writes actually exist and can be released if he opens the original manuscripts. I don't want to give too much away. I'm not going to tell you how that happens. But, he's the guardian of these creatures that he's created. He has to keep them under lock and key. The film is the story of how they all are released one night. It all takes place mainly over this one nightmare night, where there's literally hundreds of monsters and creatures all around the town. Destroying, wreaking havoc, it's up to me and these kids to get them back in the bottle. The monsters are a big part of the movie. Can you talk to us about the monsters? If you could be a monster which one would you be? Jack Black: If I could be any of the monsters which one would I be? I don't want to be a monster. Slappy is the mastermind, he's the genius of the group. But I don't want to be a two foot, wooden, Pinocchio monster boy. Pinocchio never barfed green goo. Did he? Maybe he did, when he was in that whale, might have accidentally eaten some kelp. But I'd probably go with the Yeti, The Abominable Snowman, just because he's very muscular and once his white hair blows in the breeze he can actually look pretty majestic, pretty heroic in certain light. The ladies love The Abominable Snowman! Was that the monster you were the most excited to see? Jack Black: It was one of the ones. That was one of the ones when Rob first showed me the artwork, the conceptual artwork for all the monsters, my eye was drawn to it definitely. And also I have a history with Sasquatch, some people may know [Laughs]. You've played characters based on real people. Can you talk about how much of this did you want to be kind of true to who R.L. Stine is, and how much of it is your own? Jack Black: Well, with Bernie that was just a biopic, so I was going for total accuracy. With this one, yes I'm playing R.L. Stine in name, but none of the things that are happening here actually happened in R.L. Stine's life. It's a fictionalized version. He's a sweet guy, a really great guy to hang out with, funny. He doesn't come across as a scary or mean dude. The way that this character is written is a lot different than the way he actually is in real life. So I took lots of liberties, I don't really look, sound or act like him in this movie. In other words, don't be coming into this movie like, "I know R.L. Stine, this is no R.L. Stine." Were you nervous when R.L. Stine was on set? Jack Black: Of course, yeah, I got a little nervous. But it was cool, he was laughing, he was into it. Can you talk to us about voicing Slappy? Maybe a sample? Jack Black: You know, I haven't started yet. We've had scenes with Slappy. We've got an amazing ventriloquist who has been controlling the puppet. It's not called a puppet. What is it called? Jack Black: He's not a marionette either, it's just a dummy, just a ventriloquist dummy. Did you meet Avery? He's too good at it. I think they did one of those like nationwide searches of ventriloquist dummy professionals and this guy just sort of came out of the woodwork. He was blowing everybody out of the water, he was by far the best. Have you done any scenes with him yet? Jack Black: Yeah, and it's creepy. I was a little nervous because he was so captivating and magnetic. I was like, "He's upstaging me. He's too good!" His voice is so awesome. I'm just going to try beating what he does. I wouldn't be surprised if it ends up being his voice. I don't know if I'll be able to top his performance, to be honest with you. We'll see what happens in the ADR stage. Has there been a set piece in particular that you've enjoyed filming thus far? Jack Black: Well, so much of it is just in our imagination. There's giant creatures that are not really there, like the praying mantis, there's a sequence with a giant praying mantis that's amazing. I imagine it's going to be amazing. We also did a great scene with The Abominable Snowman. You're screaming at the top of your lungs, your hair is blowing back, and you imagine these things but you don't really know until you see it. All of this takes place over the course of one night, do we get to see how the rest of the town reacts to the monsters in their town? Jack Black: Yeah. You get to see to see the whole town and how it's affected by these creatures of the night. I was just thinking also that we had an amazing scene with Slappy that sort of takes a psychological turn, it kind of like -Did you ever see the movie Magic with Anthony Hopkins? It was before he became famous for playing Hannibal Lecter, he did this movie in the seventies called Magic. He's a puppeteer, he controls his ventriloquist dummy, but then the dummy starts to talk on its own, but you're never really sure, "Wait, is it talking on its own or is Anthony Hopkins going insane?" There was a little bit of flavor of that while we were doing the Slappy scene. It was pretty cool. I felt like there might be an Oscar. It's not for me to say, but I just felt like, "I'm really kicking but right now, my acting is pretty off the charts." Can you talk a little bit about your character's relationship with Odeya Rush, the father daughter relationship in the film? Jack Black: Right. How do you already know all this? Did someone tell you? Oh, they told you, right. Yeah, she's my daughter, she plays my daughter. I can't really go into it, because if I go into it then it starts to give things away. They had me sign a non-disclosure agreement, there's certain subjects I can't talk about. I'm very protective of her, I don't want her dating strange boys. I don't want her really leaving the house because she, as I am, is a keeper of this secret of the creatures actually existing and a protector of the manuscripts. So, just like any father, it freaks me out when she leaves the house or she's not around. I'm a little more protective than your average father and super cranky. What's your favorite thing about making a movie for kids? Jack Black: It's something that my kids can see. I don't really think of it differently as making a movie for grownups or making a movie for kids. If it's boring it's boring, so you want it to be entertaining and I think funny is funny. The only real difference is language. You can be just as funny, I'm convinced, in a PG movie, we just got to get a little more creative. Where you ever tempted to add elements to the movie that might make adults more into it or more relatable to adults? Jack Black: Yeah, sure. There's jokes in there that are for the parents and for any grownups that might be in the audience, definitely. It's a mistake to just go make a movie where the whole thing is talking down to the kids. You don't have to do that, kids can laugh and parents can laugh at different parts. You see that with all of the great kid's movies like Toy Story 3, I loved it, it was a great movie. Yeah, a good movie is a good movie. Do you guys do a lot of improvising on the set? Jack Black: There's a little bit of playing around, definitely. Rob's real cool about letting you try things. At the end of the day you got to do one take at least as written, that's a studio rule. But then you try to beat it on other takes. You haven't really worked on his voice yet. Avery's been doing an amazing job. Do you think you will watch the old Nickelodeon, Night of the Living Dummy, to see how his voice was in the nineties? Jack Black: I probably will. I like to turn over all stones, see what everybody else did. A lot of times that's when I do my best stuff, after I see someone else do it and go, "Horrible! Let me show you how it's done!" Maybe that's how it'll happen. There seems to be a lot of nods to past films and big horror icons. Has any of this influenced your performance? Jack Black: No, I haven't really been influenced by the past. There's a couple of nods to Stephen King, R.L. 's arch-rival in the horror genre. There's a cool scene in there with a lot of nods to The Shining, which also happens to be my favorite horror movie of all time. Is that why you're credited on the call sheet as Stanley Kubrick? Jack Black: You know, maybe that is why. How did you know I was Stanley Kubrick? Don't tell anybody that, that's my secret identity! How has it been filming in Georgia? Jack Black: We went to a small town up north of here called Madison, Georgia. I thought it was Madison, Wisconsin. It's a cool little town, we kind of took over the town and shot a scene on their main street where we had to destroy the whole street. It had been ripped apart by monsters. Basically the whole town was watching while we filmed from every nook and cranny and they were into it. Was there a fan fit? I'm not like the Beatles, people don't come running and screaming. Can you talk about working with young actors? Are they excited to be around you? Jack Black: It's cool to work with kids, teenagers, because they're old enough to have seen School of Rock when they were like seven or eight. Yeah, I'm like a God.